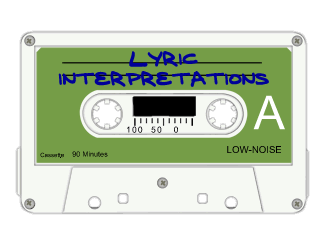 We're starting a new thing at Lyric Interpretations: We're going to review music books. There's shelves of the things sitting around the Utility Muffin Research Facility, and for those of you who always comment wondering at our research prowess, we'll share some of the discoveries we've made. Besides, how many music blogs online right now are reviewing music books? Us, that's how many. Kill Your Idols: A New Generation of Rock Writers Reconsiders the Classics, edited by Jim DeRogatis & Carmel Carillo. It's a collection of various rock journalism writers setting out with the deliberate intention of goring all of rock criticism's most sacred cows. Some of them are quite obviously playing devil's advocate; a few more are trolling us on purpose. But even at its lowest point, the book is a challenge to your open-mindedness, and you just may find yourself cringing as you have to admit the occasionally solid argument. Thus, your childhood is sunk, your dreams tarnished, and your gods revealed to have feet of clay. Or, you might gleefully be nodding as bands and albums that have gotten away with murder for far too long are definitely taken down a notch. Watch how quickly the essays start to make sense when they're attacking someone you don't like! That being said, it's kind of missing the point to review this work objectively; it's made to be collided with, which is exactly how I will take it here. I fanned through the contents, deciding to start with the essay likely to wound me the deepest, because I might as well get the toughest medicine over with. There's the Beach Boys' Pet Sounds. Ouf! Pink Floyd's The Dark Side of the Moon. Ah, that will sting, but it won't make me safeword. My pulse quickened upon spying Dead Kennedys' Fresh Fruit For Rotting Vegetables up against the wall, and I was about to turn to it when I spied Captain Beefheart's Trout Mask Replica. No! My preciooooous! Tears of anticipated pain already dampening my lacrimal glands, I turned to Jason Gross' essay ready to see my martyr crucified. Seven pages later, I remained unshaken. Gross really doesn't rip into Trout Mask Replica that much beyond saying that it isn't good dance music. I had braced myself for a pummeling and had received a tickle. And Trout's a good target - you could go conservative and declare that self-indulgent gurus deliberately breaking every rule isn't art, but mere rule-flaunting when the rules exist for a reason, etc. I turned to Marco Leavitt's attack on the Dead Kennedys. Leavitt did a much better job working me over. Right in the first paragraph, he zeroes in on Jello Biafra's self-righteous preaching and pompousness. Yes, speaking as a DK patch-wearing fan, that stung. And in fact Jello takes a far savager beating here than the album or the music or the band itself, which then veers shy of the target by going for the ad hominem on Biafra. But starting from that, it also savages the punk culture and mindset - there's no such thing as a non-poser punk! - and skewers back right down into arguing that the fruit of this vine must be rotten due to the bitter soil it is planted in. OK, I guess I couldn't ask for more. But memo to Leavitt: You really missed the whole point of "Holiday in Cambodia". Still savoring the endorphins, I turned to an essay I was almost guaranteed to love, David Menconi nailing stakes into the heart of Radiohead's OK Computer. Because emo-wangsty trophy-generation college rock brings out the Hitler in me like almost nothing else can, I anticipated that I would be gleefully joining Menconi in a bloody feast of Radiohead's entrails. So, what about OK Computer? It was over-hyped! Well, yes, tell us something we don't know. And it was hyped and hyped and hypehypehyped. Uh huh, and your next point is? Well, yeah, it's also music to slash your wrists by - particularly hilarious is the description of a social experiment where OK Computer was played for smart 5th-graders who were then prodded to draw what was in their heads, and then they all drew death and skulls and suicides and razor blades. But oh, yes, hype. And OK, finally he talks about the fact that this music itself is dull and slow and grim and self-indulgently depressing and Ritalin-addicted soft-shoe. God, finally! I was beginning to wonder if I'd have to finish myself off over here. Now, do you all see how much fun I'm having? That's what makes this a good book: It's a mirror disguised as a book, and will challenge your assumptions and make you rethink some of the most popular, critically respected acts in Western rock. It's important to do that, without being all THAT important. More like eating your Brussels sprouts once in a while, it kind of becomes not an issue if you actually love Brussels sprouts.